Today is the day before Ash Wednesday, called Mardi Gras or Fat Tuesday. Traditionally, it is the last day for Christians to indulge before the sober weeks of fasting that come with Lent. Formally known as Shrove Tuesday, Mardi Gras has long been a time of extravagant fun for European Christians. In many southern states of the USA Mardi Gras is a traditional holiday. The most famous celebration takes place in New Orleans, Louisiana. It has been celebrated there on a grand scale, with masked balls and colorful parades, since French settlers arrived in the early 1700s. 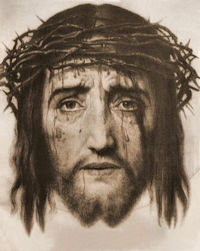 On April 17th, 1958, His Holiness Pope Pius XII confirmed the Feast of the Holy Face of Jesus on Shrove Tuesday (Tuesday before Ash Wednesday) for all the dioceses and religious orders who would ask for the Indult from Rome in order to celebrate it. You can learn more about this devotion at Holy Face Devotion and at the Holy Face Association. Historically today is the feast of St. Catherine de Ricci a native of Florence, Italy, who became a Dominican tertiary in 1535 and eventually filled the offices of novice-mistress and prioress. She was famous for her ecstasies in which she beheld and enacted the scenes of our Lord's passion. It is said that she met St. Philip Neri, in a vision who was still alive in Rome. Three future popes were among the thousands who flocked to her convent to ask her prayers. "Behold, now is the acceptable time, behold, now is the day of salvation." The Church puts Lent before us in the very same terms that formerly she put it before the catechumens and public penitents who were preparing for the Easter graces of baptism and sacramental reconciliation. For us, as it was for them, Lent should be a long retreat, one in which under the guidance of the Church we are led to the practice of a perfect Christian life. She shows us the example of Christ and by fasting and penance associates us with his sufferings that we may have a share in His redemption. Here are a few suggestions to help you celebrate the final day before Lent. Today is Fat Tuesday, or Mardi Gras! Try some of the traditional recipes linked here. When eggs were among the foods that were forbidden by the Church during Lent, people would use them up on Fat Tuesday by mixing up large quantities of pancakes or doughnuts (also known as fastnachts). Read Maria von Trapp's explanation of the traditions associated with Carnival, or Fat Tuesday here. Sing this American favorite, Turkey in the Straw, with your children as part of your Mardi Gras celebrations. Discuss Jesus' Gospel teaching for today, He who would be first must be last, with your children and ask them how they can put others in the family before themselves. Keep it simple and practical — setting the table, washing the dishes, folding laundry, watching the little ones, doing homework right away. What does it mean to become a child spiritually, that we may enter Heaven and be received by Christ Himself? We can learn much from St. Therese of the Child Jesus about spiritual childhood. Begin reading her Story of a Soul. Read Fr. William Saunder's article, Shrove Tuesday and Shrovetide, from the Catholic Culture Library. The early testimony to St. Catherine's sanctity is quite striking. Her biography was written by F. Seraphin Razzi, a Dominican friar, who knew her, and who was fifty-eight years old when she died. The nuns of her monastery gave an ample testimony that this account was conformable partly to what they knew of her, and partly to manuscript memorials left by her confessor and others concerning her. Printed in Lucca in 1594, it is therefore considered highly reliable. Her life was again compiled by F. Philip Guidi, confessor to the saint and to the Duchess of Urbino, and printed at Florence in 1622. Fathers Michael Pio and John Lopez, of the same order, have given abstracts of her life. Since St. Catherine died in 1589, we can see how quickly the story of her life was told. After some years her father took her home. She continued her usual exercises in the world as much as she was able; but the interruptions and dissipation, inseparable from her station, gave her so much uneasiness that, with the consent of her father, which she obtained, though with great difficulty, in the year 1535, the fourteenth of her age, she received the religious veil in the convent of Dominicanesses at Prat, in Tuscany, to which her uncle, F. Timothy de Ricci, was director. God, in the merciful design to make her the spouse of his crucified Son, and to imprint in her soul dispositions conformable to His, was pleased to exercise her patience by rigorous trials. For two years she suffered inexpressible pains under a complication of violent distempers, which remedies themselves served only to increase. These sufferings she sanctified by the interior dispositions with which she bore them, and which she nourished principally by assiduous meditation on the passion of Christ, in which she found an incredible relish and a solid comfort and joy. After the recovery of her health, which seemed miraculous, she studied more perfectly to die to her senses, and to advance in a penitential life and spirit, in which God had begun to conduct her, by practicing the greatest austerities which were compatible with the obedience she had professed; she fasted two or three days a week on bread and water, and sometimes passed the whole day without taking any nourishment, and chastised her body with disciplines and a sharp iron chain which she wore next her skin. Her obedience, humility, and meekness were still more admirable than her spirit of penance. The least shadow of distinction or commendation gave her inexpressible uneasiness and confusion, and she would have rejoiced to be able to lie hid in the center of the earth, in order to be entirely unknown to and blotted out of the hearts of all mankind, such were the sentiments of annihilation and contempt of herself in which she constantly lived. It was by profound humility and perfect interior self-denial that she learned to vanquish in her heart the sentiments or life of the first Adam—that is, of corruption, sin, and inordinate self-love. But this victory over herself, and purgation of her affections, was completed by a perfect spirit of prayer; for by the union of her soul with God, and the establishment of the absolute reign of his love in her heart, she was dead to and disengaged from all earthly things. And in one act of sublime prayer she advanced more than by a hundred exterior practices in the purity and ardor of her desire to do constantly what was most agreeable to God, to lose no occasion of practicing every heroic virtue, and of vigorously resisting all that was evil. Prayer, holy meditation, and contemplation were the means by which God imprinted in her soul sublime ideas of his heavenly truths, the strongest and most tender sentiments of all virtues, and the most burning desire to give all to God, with an incredible relish and affection for suffering contempt and poverty for Christ. What she chiefly labored to obtain, by meditating on his life and sufferings, and what she most earnestly asked of him, was that he would be pleased, in his mercy, to purge her affections of all poison of the inordinate love of creatures, and engrave in her his most holy and divine image, both exterior and interior–that is to say, both in her conversation and her affections, that so she might be animated, and might think, speak, and act by his most Holy Spirit. The saint was chosen, very young, first, mistress of the novices, then sub-prioress, and, in the twenty-fifth year of her age, was appointed perpetual prioress. The reputation of her extraordinary sanctity and prudence drew her many visits from a great number of bishops, princes, and cardinals-among others, of Cervini, Alexander of Medicis, and Aldobrandini, who all three were afterwards raised to St. Peter's chair, under the names of Marcellus II, Clement VIII, and Leo XI. Most wonderful were the raptures of St. Catherine in meditating on the passion of Christ, which was her daily exercise, but to which she totally devoted herself every week from Thursday noon to three o'clock in the afternoon on Friday. After a long illness she passed from this mortal life to everlasting bliss and the possession of the object of all her desires, on the feast of the Purification of our Lady, on the 2nd of February, in 1589, the sixty-seventh year of her age. The ceremony of her beatification was performed by Clement XII in 1732, and that of her canonization by Benedict XIV in 1746. Her festival is deferred to the 13th of February. 1 Gallon. apud Contin Bolland. Acta Sanctorum, Maii, t. 6, p. 503, col. 2, n. 146. 2 Ibid. p. 504, col. 2. 3 In Bullar. Cherubini, t. 4, p. 8. Read St. Catherine de Ricci, V., O.S.D. - EWTN.com and the full text of her letters.